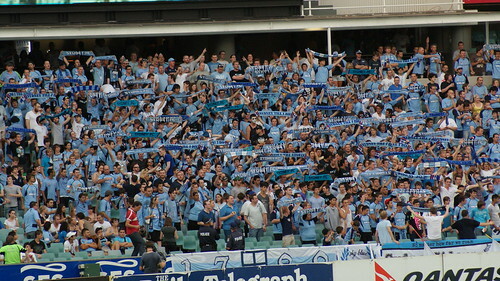 A humid evening at the SFS saw Sydney FC play host to nemesis Melbourne Victory on Saturday. Around 300 Melbourne fans made the trip, but they were dwarfed by the Sydney fans that flocked to the stadium for the season-defining fixture. A relatively high crowd of 11 387 saw FC equalize in extra time for a 1-1 draw. In what was to be an exciting match Sydney lined up with an unchanged team; the third time in a row they’ve done so with this eleven. The first action of the night was a corner to Sydney. The Byun cross eventually found Moriyasu who shot from the top of the box. Ricocheting, it found Kellar but his header was too weak and the resulting corner from the other side moments later had a similar result. Melbourne seemed to be looking to play counter attacking football. Their first attempt, a Hernandez free kick from just outside box was deflected off the wall. In the 14th minute a long cross from Jamieson across the pitch found Nicky Carle who was subsequently fouled by Broxham just outside the box. Ricardinho received only a talking to from referee Matthew Breeze after blatently pushing Kellar out of the wall prior to the kick being taken. Minutes later he did receive a yellow for kicking the ball away. The 22nd minute almost gave Melbourne the lead when a cross into the box was not dealt with by Stefan Kellar. Danny Allsopp could not get anything on it. A flurry of corners for Sydney, indicative of their possession and attacking first half play, led to a number of chances, none of which came to fruition. 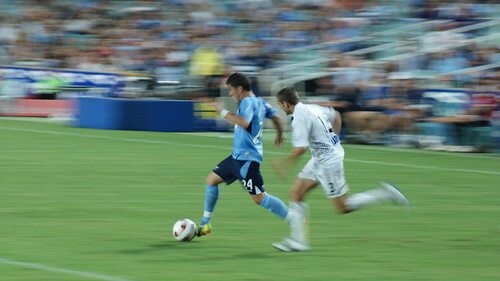 On 35 minutes Dimi Petratos showed his legs with a nice run in the centre of the field, provided by a bursting Kellar. The shot however, was wide. A minute later he repeated the movement from the left again putting the ball wide across the ‘keeper. Allsopp, who would have a busy night, latched onto a through ball just outside the six-yard box but could only find the hands of the previously untested Sydney goal-keeper Liam Reddy. A Victory corner in the 42nd minute led to a shot from Celeski but again the shot found Reddy. Simultaneously, Rodrigo Vargas received further treatment for a cut to his head, bleeding too much for Breeze’s liking. Moriyasu finished the half with a decent strike from long range dipping over the post. Nil all at half time. Melbourne came out a different team in the second half with a renewed energy, spurred on by some likely hard words from coach Ernie Merrick. In the 51st minute Hernandez lost his man, Jurman, and made a phenomenal pass from right-field, finding Danny Allsopp on goal. Allsopp coolly slotted home giving Melbourne a one nil lead. As the Victory fans celebrated, flares were lit after the goal in the away end – thankfully extinguished by the throng of security guards circling them. The pressure seemed to be completely reversed with Victory having all the opportunities on goal. Sydney’s first half composure was lost and it seemed only a matter of time before Melbourne bagged another. A five minute period of possession by Sydney culminated in substitute Shannon Cole cleverly beating his man and having a powerful strike – which only cleared the crossbar by inches. After this period of play it became a closer affair. With time ticking away Sydney upped the effort and a wonderful through pass from Carle only needed Dimitri Petratos to tap it in. However the ball ran away from him and found an awaiting Petkovic. Carle almost leveled on 84 minutes; heading powerfully only to be denied by an outstretched Petkovic. Down the other end Allsopp had yet another opportunity but failed to put the game beyond doubt. 90 minutes was called but the game was not over. ‘The Surgeon’ Juho Makela instinctively converted a Nick Carle cross, leveling the scores a minute before Matthew Breeze called time. Negative tactics were employed throughout the game by Melbourne in an attempt to waste time and Petkovic eventually saw yellow in the final moment of the match for his efforts during goal-kicks. 1-1 would be the final score, a result the Victorian’s will be happy with considering their absence of key players. Sydney will be ruing missed opportunities in the first half, a draw not really enough for the Sky Blue to continue their charge up the ladder. Editor of The Football Sack for three years, Matthew now spends his time sipping Merlot whilst watching the latest installment of Thursday FC.